This is the first of what I intend to be an intermittent series of short posts about individual wines I’ve recently enjoyed. Diane and I drank the bottle named above, a Di Meo Fiano di Avellino 2012, with a relatively simple dinner of snapper soup (brought home from a trip to Cape May) and filets of John Dory (brought home from our local Citarella). The nutty, mineral scent of the wine tempted from the first pour – and then the wine itself stood up and kissed the soup and danced with the fish and kept growing more interesting as it opened in the glass. We finished the bottle easily and looked around for more. 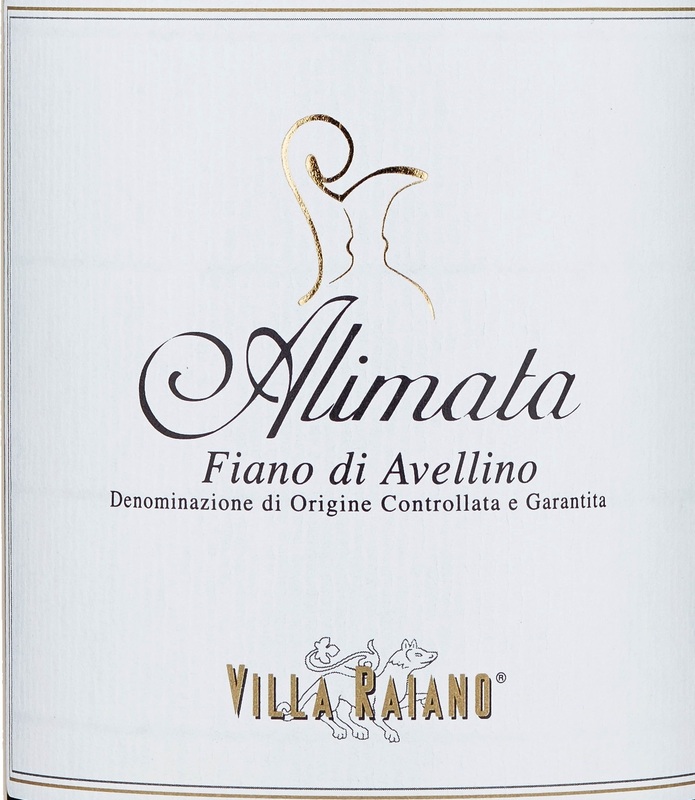 Fiano is, without qualification, a great white variety, as fine as Riesling or Chardonnay, and in the vineyards around Avellino, high up – 550 meters up for Di Meo – in the complex volcanic soils of those hills, it achieves its maximum expression. Writing some time ago about the wines of Campania, I said that some day wine lovers would regard the Avellino zone with the same reverence they accord Burgundy’s Côte d’Or. Every time I open a bottle like this Fiano, I feel that even more strongly: This simply is a world-class white wine. Fiano is never as fat on the palate as a white Burgundy: It’s linear, and often more subtly elegant, with a fine nut (hazelnut and almond) and mineral-inflected complexity that grows more intriguing with every year of bottle age. About a year ago, Diane and I drank (with friends to help) a magnum of Di Meo’s 2000 Fiano di Avellino, and it was spectacular, showing not the slightest sign of senility and all the signs of depth and all the layered flavors that mineral-laced soils and mature fruit (lots of dry pear and hazelnut) can convey. Di Meo is becoming something of an aged Fiano specialist, but the natural structure of the Fiano variety is such that almost any well-made Fiano di Avellino will mature beautifully, if you can keep yourself from enjoying it while it’s still young. 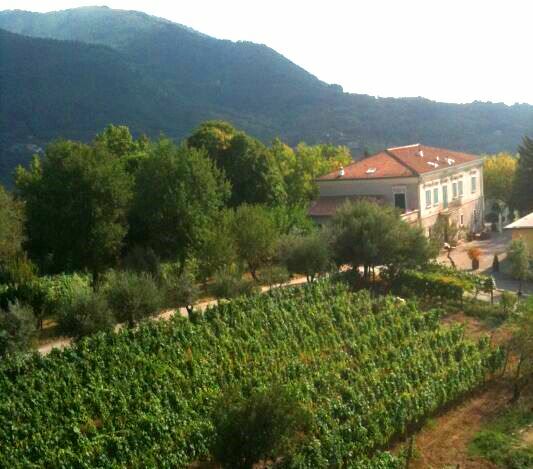 In addition to all its natural advantages of soil, site, altitude, and climate, the Avellino zone is blessed with a throng of passionate and knowledgeable winemakers. In addition to Di Meo’s, you can find excellent Fiano di Avellino from Cantina del Barone, Ciro Picariello, Donnachiara, Feudi di San Gregorio, Mastroberardino, Pietracupa, Tenuta Sarno, Terredora, Urciuolo, Villa Diamante, Villa Matilde, Villa Raiano and probably a few others I’ve forgotten. When next you buy some, try squirreling a few bottles away in some corner where you can forget them for a few years: They’re worth the wait.
. . . is that we bury, finally and for all time, the fiction that Italian white wines can’t age. Enough knowledgeable writers have tried, for at least the last decade, to tell consumers otherwise, that I would have thought by now that this piece of misinformation had died a natural death, but nevertheless I keep hearing it, and often enough from people who ought to know better. So, as what I hope will be one more nail in its coffin, my Christmas gift for all worthy winos will be an account of my recent experience with two very different Italian white wines, both of the 2000 vintage. I have long had in my “cellar” (regular readers will understand the quotation marks) a single bottle of Bucci Verdicchio 2000. Too long, in fact: This is a wine that was meant to be drunk years ago, but somehow it kept getting passed over. Bucci is, in my opinion, the best producer of Verdicchio in the Marches, and Verdicchio is probably one of the most underestimated and underesteemed of all the Italian white wines – at least in this country. Ampelio Bucci is a charming and patient man: That patience sustained him for many years in dealing with his enologist, the brilliant but difficult and quirky Giorgio Grai. Grai is – or was – nearly legendary in northern Italy for his skill in crafting long-aging white wines, and he guided the yield of Bucci’s vineyards into two forms, a “simple” Verdicchio, designed for youthful drinking, and a more complex Villa Bucci Verdicchio Riserva, designed for longer aging. I have drunk many 10-year-olds of the riserva, and they were uniformly lovely – fresh and deep, with Verdicchio’s characteristic pear, apple, and mineral flavors beautifully balanced against a restrained acidity. 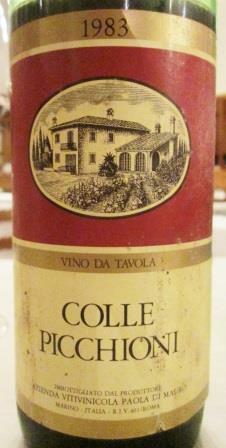 But the wine I am talking about now isn’t that one: It’s the basic Verdicchio, the wine meant for being drunk young. Somehow it hadn’t been, and once its “use by” date had in my mind passed, I kept leaving it behind on the assumption that it was probably already dead or dying. So, recently, when Diane and I were having an unusually fancy first course (American Osetra caviar) with a light dinner of omelets, I decided to dispose of the bottle once and for all. Carefully chilling a back-up bottle of white Burgundy, I poured the 17-year-old Bucci, fully expecting to taste it and dump it. Boy, was I wrong! The wine looked old, but pretty – golden amber and translucent. Its aroma was intriguing – very lively, with some floral notes but mostly complex mineral scents, like flint and chalk and slate. In the mouth, it felt light, balanced, and live – still that restrained acidity so typical of Bucci, sustaining complex flavors of unripe pears, untoasted almonds, and the ever-present mineral notes, with a pleasing butteriness in the finish. We were amazed, and our pleasure only grew as the wine opened further in the glass and responded beautifully to the very different challenges of caviar and omelets. This was not just a great Verdicchio, it was a great white wine from anywhere, of any age. That was my instance of unplanned-for glorious longevity. My second wine story, a Di Meo Fiano di Avellino Selezione Erminia 2000, is the very opposite – in terms of planning, not quality. This is a wine that was designated for long aging right from the start, and only quite recently acquired by me. 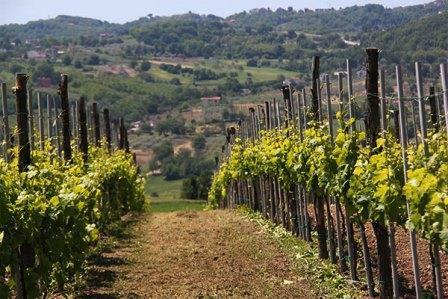 The Di Meo family tends high-altitude vineyards (around 550 meters) in the most prized wine-making part of Campania, the Fiano, Greco, and Taurasi zones surrounding Avellino. The harvest of 2000 in most of Italy was a good one: in some places too hot, but in most bringing the grapes to a perfect point of ripeness, with fruit, sugar, acid, and tannins in excellent balance. That year, as an experiment in aging their indigenous white wines, the Di Meos selected a particular plot of Fiano within one of their best vineyards for special treatment to test how well a traditionally made white wine could age. The grapes of this plot stayed on the vines longer than others of that harvest, not to super-ripeness, but definitely beyond the hang time for ordinary vinification. Then they underwent a long maceration period before soft pressing and low-temperature fermentation in steel. After that, the wine rested on its fine lees for a whole year, still in steel, before being racked off to repose in more steel and then bottle for a total of 13 more years before release. I hope everyone reading this gets the chance to taste wines similar to these – often. That’s my Christmas wish for you. If you haven’t enjoyed it yet, it’s the kind of experience that will completely revise your notion of what white wine is all about. Rome has many charms, but an abundance of great wine is not one of them. Once upon a time – my brother and I first visited Rome in 1964, so this is history, not fable – your wine options in most trattorias were rosso or bianco, both vino sfuso – that is, drawn from a barrel or demijohn, not from a bottle. The red was usually some form of Chianti and the white was almost always brown (from rapid oxidation, then a serious problem for Italian white wine) and usually some form of Frascati. Much has changed for the better since then. The white wine now really is white, and almost invariably young and fresh and charming. And although now-much-improved Frascati is still ubiquitous, most trattorias – and certainly anything calling itself a ristorante – will also offer several other options from other parts of Italy. Red wine lists seem to have grown even more, now providing good choices of many varieties from all over Italy – including, at long last, a growing representation of indigenous Lazio (Rome’s region) bottlings. Nevertheless, really deep wine lists are still few and far between, and the lover of older wines has to search pretty hard to find a mature bottle of almost anything. So when Diane and I went recently to Rome for a week of pure vacation – I promised no winery visits, no tasting sessions – we contented ourselves mostly with the kinds of wines that provide plenty of pleasure without needing long cellaring. Rome offered many of those. We tried many young Frascatis, of course, and all were genuinely charming, with the light floral/mineral nose and palate characteristic of the breed. One of the most interesting, which we tasted at the Trimani wine bar, was in fact not a Frascati but an IGT Lazio wine from Casale Certosa. It was a 2014 (almost all the whites were 2014, a very few 2015) Alborea, a rich, lightly golden wine of greater than usual intensity. It was blended from Grecchetto and Malvasia Puntinata, the latter grape a Lazio specialty and usually an important component of Frascati. I don’t think this wine is imported to the US. One of the advantages (and limitations, from a wine journalist’s point of view) of drinking in Rome is the opportunity to taste wines, both kinds and producers, that don’t always make it across the pond. Other whites that we enjoyed included a lovely light, refreshing 2015 Pigato from Liguria (Pigato is the regional name for Vermentino), a characteristic Falanghina from Benevento by Vinicola del Sannio, and a 2015 Mastroberardino Fiano – the latter, of course, in a distinctly different weight and quality class from the lighter more apéritif style of the preceding wines. 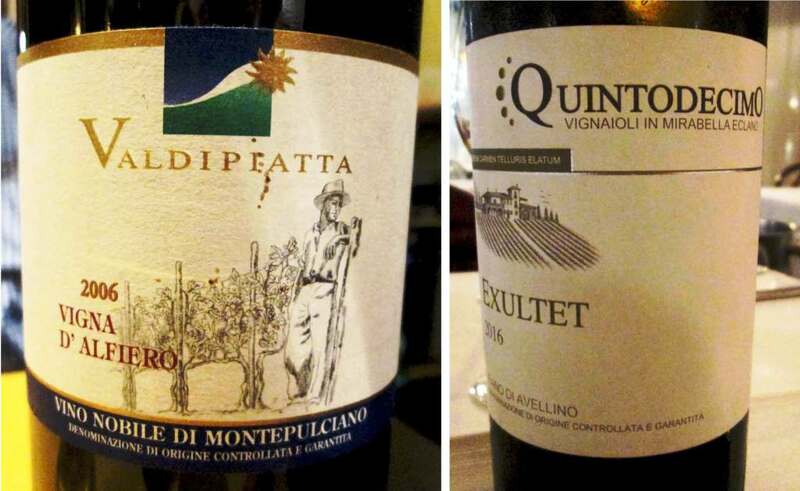 BTW, we tasted a lot of these wines by the glass at two of our favorite places in Rome to get a light lunch: the wine bars Cul de Sac and Angolo Divino. Both offer a splendid array of cheeses and salume and light dishes, though at both you can order more substantially if you wish. 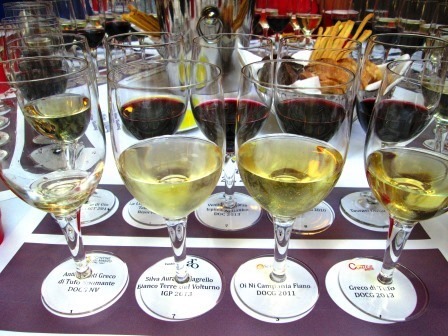 Either way, you can taste glasses of as many wines as you have time and capacity for, from a well-chosen list, with many, many more wines available by the bottle, should you opt to make an afternoon of it. Everywhere we dined in Rome, our choices for red wine seemed much richer than for whites. The red wine situation, it’s fair to say, is happily more complex than the white. We drank a number of familiar standbys, of course – a 2009 Mastroberardino Radici Taurasi, for instance, though that turned out to be infanticide: That bottle had years of development before it. 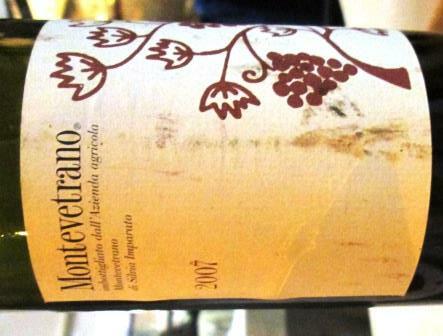 We also drank a 2007 Montevetrano, which was a lovely representative of this unusual (for Campania) blend of Cabernet, Merlot, and Aglianico. It was evolving beautifully, but it too had years of maturation to go. The slightly disappointing restaurant at which we drank it provided a wonderful instance of just how thin wine knowledge is even in seemingly better places. When I asked for a bottle of Montevetrano, our waiter didn’t recognize the name, and didn’t know it was on his wine list. I pointed it out and explained it was a Campanian wine. He looked and said “No; this says it’s from Salerno.” – He didn’t even know Salerno is in Campania. After that he disappeared for a while and, apparently after consultation with someone more knowledgeable, returned bearing the bottle and self-importantly informed me that this was one of Italy’s greatest wines – which, of course, was why I had ordered it in the first place. Most of the reds we enjoyed were younger than those two, however. One stand-out was a 2013 Villa Simone Cesanese – a native Lazio grape – that was soft, fresh, and fruity, with some real depth and excellent varietal character. We liked that so much we ordered a second bottle and made that dinner last. 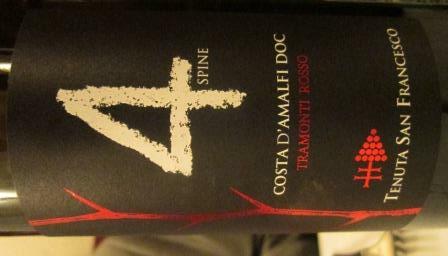 Another very distinctive regional wine, this one from the Amalfi coast, was 2012 Quattro Spine Costa d’Amalfi Rosso from Tenuta San Francesco. Again, I don’t know if this wine is available in the US, but it’s definitely worth seeking out, whether at home or abroad. 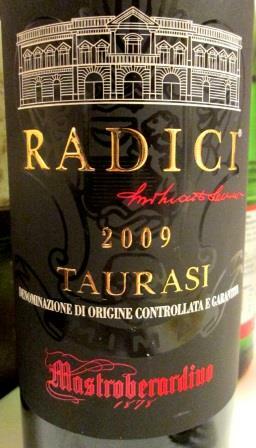 It was an intriguing blend of Aglianico, Tintore, and Piedirosso, very dark, rich and deep, powerful and elegant. I’d love the chance to taste an older bottle. The oldest bottles we had on this trip we enjoyed at Fortunato del Pantheon, and at Checchino dal 1887. At the former, our waiter walked me into the attached enoteca (a new development since we’d last dined there), where the sommelier unearthed a 2007 (not so old, but hey! we’re in Rome) bottle of Maurizio Zanella Rosso del Sebino. A blend of 50% Cabernet sauvignon, 25% Merlot, and 25% Cabernet franc, and almost inky dark, it was big, round, and soft, with very soft tannins, and tasted of mature black fruits. It proved an excellent companion to our dishes of tagliarini with white and black truffles. By far the most interesting red wine of our trip was the sommelier’s suggestion at Checchino. This was no surprise, because it has one of the best wine lists in Rome, and when asked for a more mature wine, Francesco Mariani (one of the brothers who own Checchino) suggested a 1983 Colle Picchioni Rosso (as it turned out, the same wine he had served my friend and colleague Charles Scicolone just a week before ). 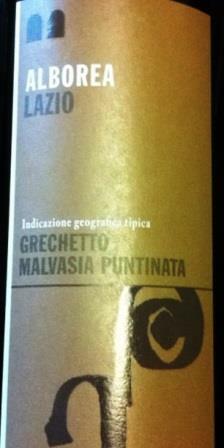 This is a Lazio wine, grown and vinified not many miles outside of Rome. It’s probably – firm data is hard to come by – a blend of the native Cesanese with Merlot and maybe Sangiovese, maybe Aglianico, maybe Cabernet; in 1983 things were still pretty loose in Lazio (Charles thinks it’s all international varieties; I’m not so sure). Francesco knows his stock: Whatever grapes are in it, this wine turned out to be perfect choice with our food, initially delicate but growing in strength as it opened. Pale garnet with an orange edge, it looked and smelled like a mature wine, the nose almost delicate. On the palate, very balanced, and even lively, with still fresh fruit suggesting dark berries that lingered into the elegant finish: a really lovely bottle of wine. Diane has blogged about the meals we ate in Rome, so the palatally curious can see what kinds of food went with the wines I’ve been talking about by clicking here. One final word: None of these wines was expensive, especially not by New York standards. The older wines cost far less than new vintages sell for at retail here, which gives you some sense of just how outrageous the price-gouging is in American restaurants. And in even the busiest, most touristed Roman restaurants, the sound levels were such that the two of us were able to speak in normal tones, which gives you some idea of what a deliberately manipulated environment most American restaurants are providing. As one of my old teachers used to say, verb. sap. sat. Save your money, and dine out in Europe. Donnachiara, the Campanian wine estate, celebrated its 10th anniversary recently by presenting a vertical tasting of its elegant Fiano di Avellino during a classic Neapolitan lunch at Il Gattopardo restaurant in New York. The food was great, and the wines were even better. I only wish that anyone who still subscribes to the myth that Italian white wines can’t age would have the same sort of opportunity to experience just how beautifully Fiano matures. 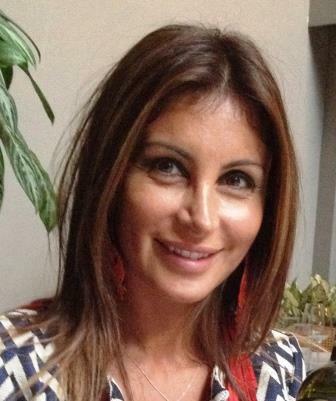 Ilaria Petitto, now the managing director of the family-owned firm (established by her mother and named for her grandmother), hosted the event and presented the wines, with additional commentary from wine journalist John Gilman. The matches were perfect in every case, and the wines remarkable for their consistently high level of quality and elegance, right from the firm’s beginnings. To my mind, Donnachiara has done amazing things for so young a firm and promises much more for the future. Indeed, Ilaria made a surprise announcement at the lunch that Donnachiara has just retained the famed enologist Riccardo Cotarella as its winemaker. Several of the journalists at the lunch expressed the hope that Cotarella doesn’t change the estate’s white wines (Fiano, Greco, Falanghina) which we all felt are already great because they are so beautifully faithful to their varieties and terroirs. But we all agreed he could help substantially with the red Taurasi, which has not yet caught up to the level of the whites. Speriamo! Here are some details of the wines we tasted. Donnachiara’s vintage notes call this “a wine with great potential for aging,” and I agree. It’s already balanced and lovely, with a long mineral finish, promising fine development. It resulted from a very wet winter, a “scorching” July, and then gradually moderating temperatures that “allowed for optimum ripeness of the fruit.” Everyone with room in their cellar should put away a case of this for 10 years. Very similar to 2015, only more so in every respect – bigger, fuller, fatter, more aromatic. That partially results from two additional years of maturation, partially from a long, hot, dry growing season that produced concentrated, structured grapes. It lacks a bit of the freshness of 2015, but it adds tremendous presence. This was – and is – a favorite white wine vintage for Campanian growers. Donnachiara describes it as “a balanced vintage par excellence” and thinks the wine is at an “optimal current aging phase.” I have to disagree: This lovely, aromatic wine is maturing beautifully, but for my palate – and from many years’ experience with Fianos of all ages – I’d say it was still quite young, with years of development still before it. If I had to choose one wine from this line-up to put in my cellar (and hope to live long enough to taste at maturity), 2011 would be the one. All Donnachiara’s white wines except this one are fermented and aged only in stainless steel, so as not to impose any other flavors on what the grapes and the vineyards give. Esoterica was a one-shot experiment, with part of the wines fermented and aged for 12 months in French oak. For me, this is the only wine that didn’t work with the food and where I felt that the true character of Fiano was obscured. It would probably taste great with foie gras, but it just didn’t work with seafood pasta. This was a difficult harvest, Donnachiara says, with too much rain early on, but the wine “has good balance and pleasant minerality, with beautiful aromatic complexity.” I found it very fine – lean and elegant, with complex almondy/mineral flavors and a very long finish: in all, quite a lovely wine, still with remarkable freshness. A hot, dry summer yielded “a large, powerful wine, with great structure and good acidity – one of the best vintages for the aging of Fiano.” I found this Fiano just plain big – huge nose, big fruit on the palate, opulent and still quite fresh, and with a commensurate long, forceful finish. I can’t guess how much longer this wine will mature, because it is such a different vintage, but right now it is absolutely voluptuous drinking. I hope I will be around to celebrate Donnachiara’s 20th anniversary. The potential of this winery – and in fact the potential of the whole Irpinia area, the heartland of Fiano di Avellino, Greco di Tufo, and Taurasi – is only now beginning to be realized. Before it started making its own wines, Donnachiara sold its grapes to Mastroberardino, and I have drunk 20- and 30 year-old Fianos from Mastro that were simply gorgeous. For Campania, Fiano could be only the tip of the iceberg: As Ilaria almost casually remarked, one of the reasons Campania doesn’t do international grapes is because it has over a hundred native white varieties. If even a few of them approach the stature of Fiano and Greco, wine lovers will have found a treasure trove. I’ve been celebrating the wines of Campania quite a bit lately, and I’m not yet tiring of doing so. Every time I think I’ve said all I have to say on the subject, a new wine or a new slant appears, and off I go. That’s what stirred up this post. A conversation with a puzzled wine lover, confused by the many wine and place names of Campania, prodded me to conceptualize a simpler way to understand some key wine geography. 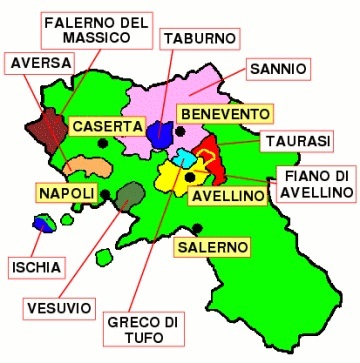 Ergo: Campania’s Golden Triangle, the points of which are Avellino (to the south), Taurasi (to the northeast), and Tufo (to the northwest) – each of which towns is the epicenter for one of Campania’s three greatest wines, Fiano di Avellino, Taurasi, and Greco di Tufo. .Let me start, at the risk of boring everyone who knows this already, with some basic geopolitical information. Campania is the region – that’s Italy’s largest geopolitical designation, the equivalent of the regions of Piedmont or the Veneto or Tuscany, for instance – and Naples is its capital. Campania fronts on the Mediterranean, which is the only part of it most tourists know, and backs on the Apennine mountains, with borders on Lazio in the north, Basilicata and Calabria in the south, and Molise and Puglia in the east. A very short way back from its seacoast, Campania rises – often quite high – into beautiful and in some places still quite wild hills, where winters feature snow and cold that belie the travel-poster fictions of palm trees and sunshine. 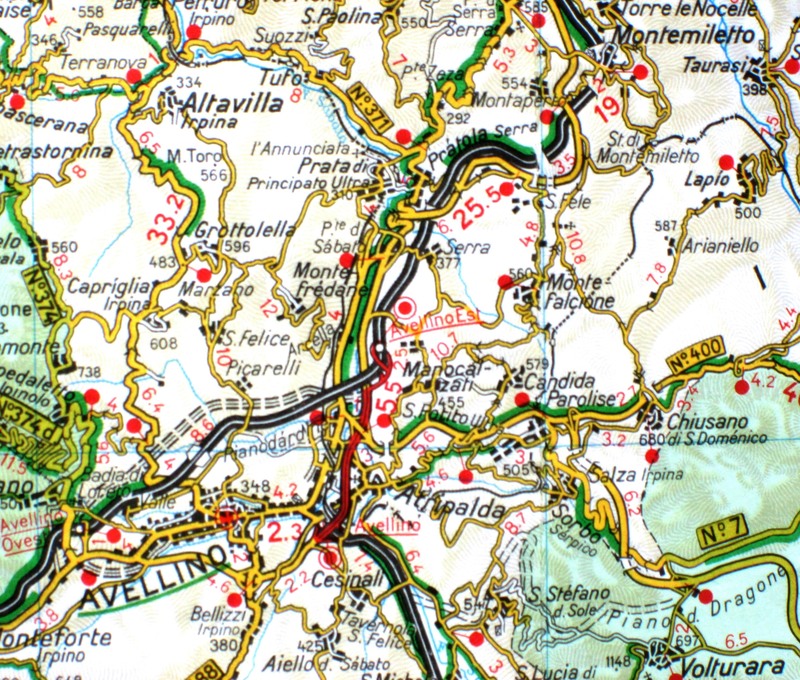 Here, some 30 kilometers east of Naples, starts the province – that’s the second largest geopolitical designation – of Avellino, at whose heart lies an ancient zone known as Irpinia. In pre-classical times, this area was the home of the tribe or nation the Romans called Sabines, against whom they warred for years and whose territory they eventually absorbed. Winemaking traditions here date from at least that time, if not earlier, and nowadays Irpinia counts as one of Campania’s premier wine-producing zones – if not the premier zone. What I’m calling Campania’s Golden Triangle sits in the heart of Irpinia, and it contains some of the most distinctive terroirs in all Italy. These are volcanic soils, old and decayed, and they are laced with alluvial deposits and sea sands, in some places stratified, in others mixed together, so that terroirs can vary tremendously within a short distance. The altitude of the land makes for colder winters than Naples and the coast ever see, but the same hills that create that altitude also make many different exposures for vineyards, which here are cultivated quite high. In some parts of the Taurasi zone, vines grow above 600 meters, and – since Aglianico requires a long growing season – harvests in the snow are not unheard of. Those same altitudes and soils, with their attendant day/night temperature differentials, give the white grapes Greco and Fiano their wonderful aromatics. Irpinia holds the greatest concentration of top-flight wineries to be found in Campania. They range in size from almost boutique to very large indeed: Some make only one wine, and some make the whole gamut of regional wines. To begin with (in many senses), Irpinia is home to the Mastroberardino firm. The Mastroberardinos are widely and justly regarded not only as the pioneer of quality winemaking in the region – the family was already exporting around the world in the 19th century – but, even more important, as the savior of serious Campanian viticulture. In Italy’s deep economic and psychological depression after World War II, when many winemakers throughout the country had decided that the only way to survive was to plant French varieties, Mastroberardino made the crucial and highly influential decision to trust Campania’s indigenous varieties – a choice for which anyone who relishes difference and distinctiveness in wines reveres the whole family. They fought for the recognition of Irpinia’s now famous three, first as DOC and later as DOCG wines, and they still make some of the best bottles of them all. They have been joined since those days by many more producers who now make the Golden Triangle the most lively locale in the Campania wine universe. Notable among the more large firms are Terredora, owned by a split-off branch of the Mastroberardinos, and Feudi di San Gregorio, an ambitious and steadily improving – from a very good base level – maker of all of the Campanian specialties. But the greatest growth and, for the wine aficionado, the greatest opportunity for discovery come from smaller producers, who have multiplied in the past 20 years. 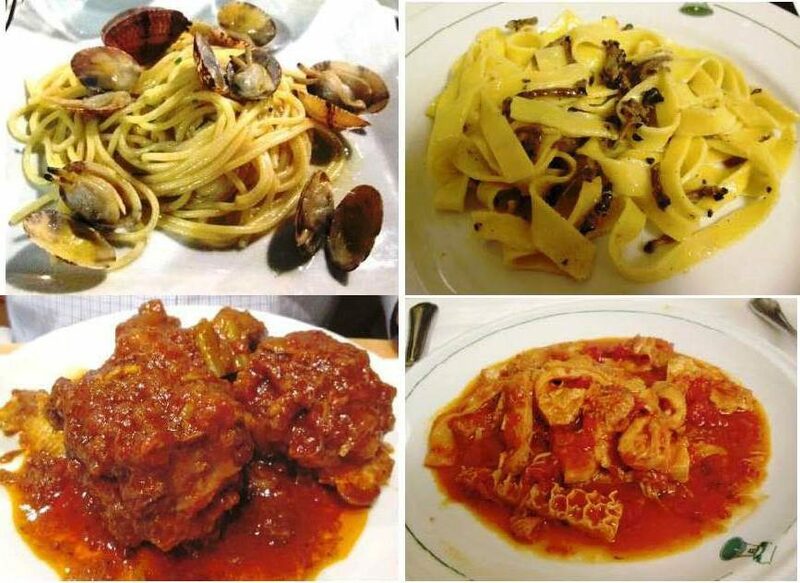 I want to call special attention here to three that I happened upon only recently, though all three are already well known and highly regarded in Irpinia. 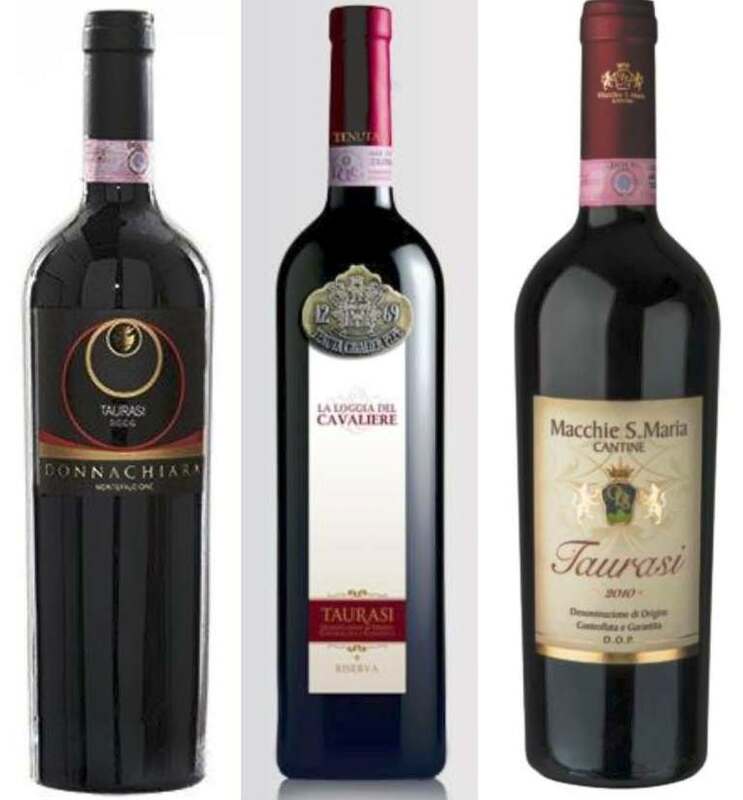 Each stands as a fair representative of the exciting wines to be found in their appellations: Rocca del Principe for Fiano di Avellino, Benito Ferrara for Greco di Tufo, and Guastaferro for Taurasi. Rocca del Principe, owned and worked by Aurelia Fabrizio and her husband Ercole Zarella, comprises about five hectares divided among three separate hillside vineyards in the township of Lapio, about 15 kilometers northeast of Avellino. All are over 500 meters high, some parts almost 600. 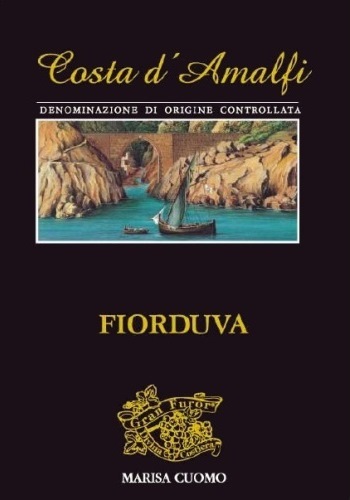 The land was worked by two generations of their family and the grapes were sold off before Aurelia and Ercole in 2004 began vinifying on their own. 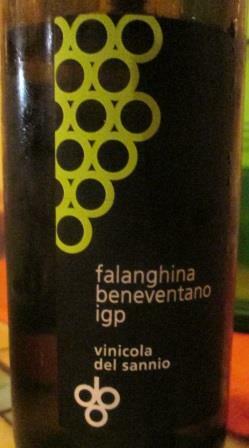 They are clearly quick learners: Their Fiano di Avellino has already been awarded Tre Bicchieri four times. I tasted with them barrel samples of the separate vineyards, which are only blended at the final assemblage of the wine. Each was strikingly distinctive, with its own gout de terroir – so much so that I thought any of them could have been bottled as a first-rate cru. Clearly, Rocca del Principe’s vineyards yield fine basic material. The eight-year vertical to which I was next treated emphatically verified that. 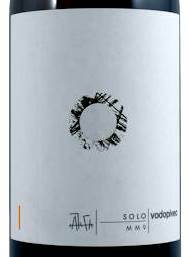 2013: Lovely, intense Fiano nose: volcanic soil, apples, and almonds. The same elements on the palate, with an ever-so-slightly buttery finish. Excellent. 2012: A warmer vintage, consequently richer and riper on the nose, with hints of peach. Again, the palate shows exactly the same elements, with a long, lovely peach-and-mineral finish. 2011: A big, pungent, lees-y nose. On the palate, round and soft, yet still acidic, with excellent fruit, and a long, sapid finish. This wine is maturing beautifully. 2010: All superlatives here: a step more mature than the ’11, the nose and palate pervaded by dried peaches. Very fine. 2009: Aroma similar to 2011, plus dried peaches and orange skins. The palate follows suit. A superb wine, intense and elegant, round and acid, and very long-finishing. The stylistic consistency from year to year, despite harvest differences, is totally impressive. 2008: On the nose and the palate, the dried peach elements are now going mushroomy – another stage of the wine’s maturation. The mineral elements are beginning to deepen, and the finish has a taste of forest underbrush. Intriguing and lovely. 2007: This wine tastes less advanced, still peachy on the nose and fruity and acid on the palate. This was a hot vintage, with lots of fruit and glycerin. Could live years yet. 2006: Deep, earthy, dried peach and orange peel aroma. In the mouth, round, slightly smoky, slightly sweet, a little less complex than the preceding wines – perhaps beginning to be a bit tired. This post is already running longer than I had planned, so I’ll break it here and in a future post talk about my similarly exciting tastings of Benito Ferrara Greco di Tufo and Guastaferro Taurasi.